About the Paraiba Chalcedony being infused with copper. My understanding of this chalcedony is that the mine site is close to the original tourmaline site, and that the cooper is a natural trace element within the chalcedony that is brings out the "Paraiba" neon color during the heat treatment that most chalcedony are placed under. 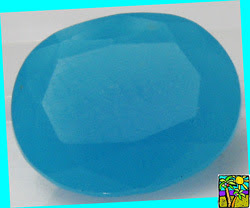 My question is this really a new gem stone, or actually a form of chrysocola-in-chalcedony that needs a little help in showing its true color?